I’ve installed the Windows 8 Consumer Preview from an ISO image (both on physical hardware and on a virtual machine) with the Windows USB DVD Download Tool. Microsoft announced the Windows 8 Consumer Preview a few weeks ago at the Mobile World Congress in Barcelona! The techie in me wants to install it right away to feel the new features and capabilities of Microsoft’s new operating system. 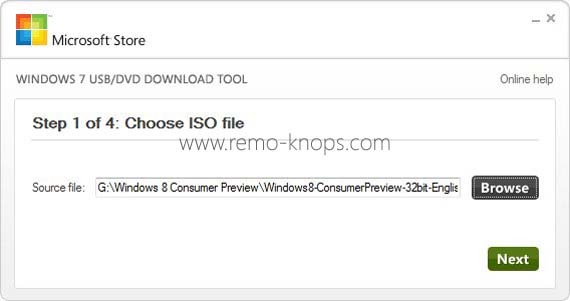 How to install Windows 8 Consumer Preview from an ISO image ? 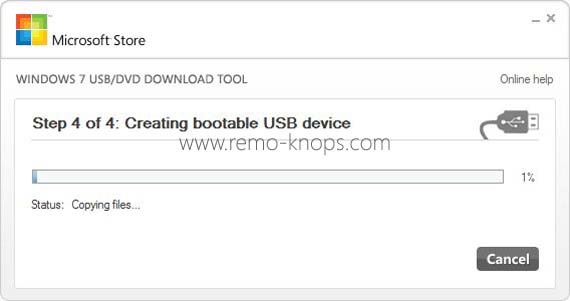 In this article I will share the four-step process that helps you prepare a bootable USB stick with the Windows USB DVD Download Tool. At first download and install the Windows USB/DVD Download Tool from the according Microsoft Store website. Click to open the Windows USB DVD Download tool installation file. Follow the steps in the setup dialogs. You’ll have the option to specify where to install the Windows USB DVD Download Tool. A prequisite for this tutorial is to download the Windows 8 Consumer Preview ISO image of your preferred language. Personally I always opt for the English language (and the 64 bit version if the hardware supports it). The screenshot above shows the default screen when you open the Windows USB DVD Download Tool. Step 1 of 4 is simply choosing the ISO-file via the browse button. Hit the next button to go to the second step. Step 2 of 4 is choosing the media type. You can create a bootable USB device or create an installation DVD. A bootable USB device is much more convenient in my opinion, while the Lenovo X60 tablet doesn’t have an internal DVD drive as well. So let’s go to step 3 of 4. You need to insert the USB device into one of the USB ports of your PC. As you can see in the screenshot above I inserted a Sony Microvault 8GB USB device. If you don’t see the USB drive right away simply hit the refresh button and select the device from the pull down menu. Hit the begin copying button to start the creation process. … after which all the (installation) files are copied from the ISO image to the USB device. When the status progress bar hits the 100% mark and the status message backup completed appears you are ready to install Windows 8 Consumer Preview from the USB device. In the Windows 7 USB DVD Download Tool you can see an online help link in the upper right corner. 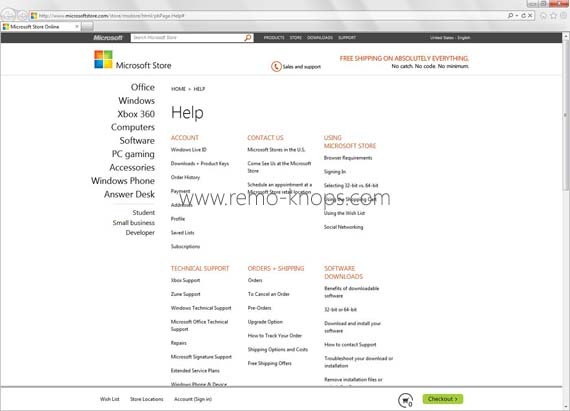 When you click on this link a help page in the Microsoft Store will be opened. 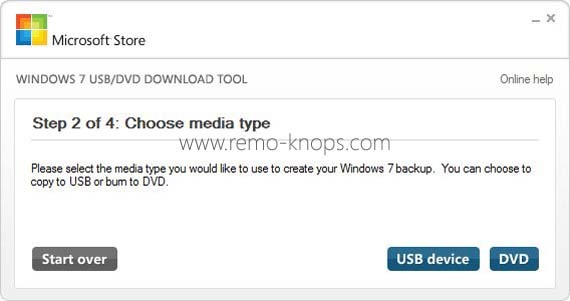 The Windows USB DVD Download Tool is a free, easy to use tool for creating a bootable USB stick to install Windows 7 or Windows 8 Consumer Preview. In my opinion this is one of the most userfriendly ways to create a bootable Windows 7 / Windows 8 installation USB device. You could also use a more advanced way of creating a bootable Windows 7/Windows 8 installation USB device using the MS DOS prompt. The tutorial is taken from Sean Liming’s book: Professional’s Guide to Windows Embedded Standard 7, chapter 6 ex604, and can be read in the MSDN article “Windows 7 Bootable USB stick“. Hey!, I found this information for you: "Windows USB DVD Download Tool review". 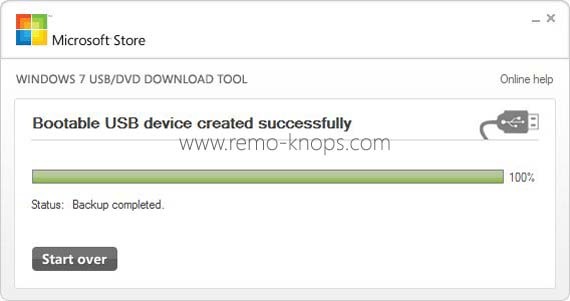 Here is the website link: https://www.remo-knops.com/3314/windows-usb-dvd-download-tool/. Thank you.